Add 3 cups of Water to the mashed daal,add Salt and keep it aside. pLACE Small Kadai for Seasoning on the stove, add Oil to it,after heating,add Mustard seeds,Jeera,Curry leaves and Hing ,after spluttering add the mashed daal along with water to the Kadai. Let it boil for a few minutes.Then switch off the stove and add the Lime Juice to the Rasam,and cover with a lid. 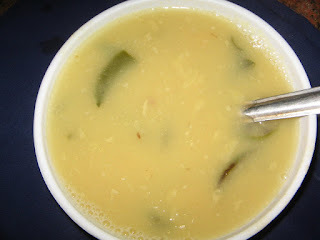 Compulsorily the stove should be Off before adding the Lime Juice to the Rasam,or else it will turn Bitter if it is boiled after adding Lime Juice. A very light Dish ideal when the other items in the Lunch or Dinner are Heavy .